DISTANCE FROM TOWN: About 13km / 15 minutes drive from Calex Rimutaka on SH2 at the top end of Upper Hutt. EXACT LOCATION: Drive east from Upper Hutt on SH2, through Te Marua, up the Kaitoke Hill, and past the turn offs to the Rimutaka Incline and the Kaitoke Regional Park. Immediately after the bridge across the Pakuratahi River turn LEFT into Marchant road. At the start of Marchant Road you will pass the old ‘Black Stump’ youth hostel (on your right). 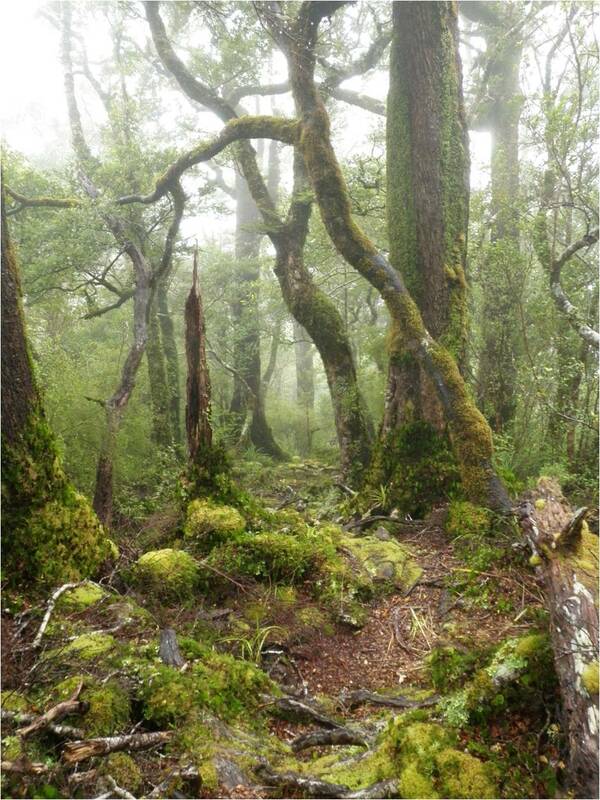 Follow the road to the end and head up the access road to the “Tararua Forest Park”. This road is sealed in places, unsealed in others, and climbs up to the carpark. Watch out for cars coming the other way – the road is very narrow. The carpark is a large clay area, and can become quite boggy – so be careful where you drive/park if you have a 2WD vehicle. TIME TO RUN: 1:30 (Elite) – 4:00 (Novice). The climbs, quad busting descent, and technical nature of some of the single track could make for a slow trip for a novice runner. DEFINING CHARACTERISTICS: 100% single track, with a wide variety of surfaces including well benched track, washed out clay tracks, a few wet boggy sections, routes through beech forest, a couple of good climbs, and one very big descent. This is an isolated and wild route: take a running buddy and make sure you have suitable survival gear. FEATURES OF INTEREST: superb native bush, this area is also home to rare native orchids if you know what you are looking for. RUN IT: Directions given here are for the clockwise direction, which gives two extended “gentle” climbs and one very hard steep downhill. There’s five logical sections to the route, described below. Carpark to Marchant Ridge track, 1.2km: A short 8-10 minute run to warm up. A short and somewhat steep climb from the carpark and then gentle undulations and climb to the turn north along the Marchant ridge. Turn left here and head up the ridge track. Up to old Dobson’s Hut site, 3.65km: There’s no hut there anymore, just the remains of the fire place and a DOC sign. The track is initially exposed as it climbs, providing great views down the Hutt Valley. There’s lots of variety along here, bush with challenging roots across the track, more open areas, sections of track that are always wet and have branches laid across the boggy bits, and sections of track that are easy and pleasant running. Dobson’s down to Smith’s Creek Shelter, 2.3km: Initially starting out as a fairly open track through low scrub and open bush as it heads up and over a low bump. The route for the most part through here is obvious, having been worn by the feet of many trampers over the years. Once the track descends into the bush it becomes very steep in places with lots of potentially slippery tree roots – parts are unrunnable except by the insane. Make sure you keep an eye out for the DOC track markers, as sometimes the track is less obvious through the forest. Eventually you’ll make it down to the valley floor. Follow the signed trail left to Smith’s Creek Shelter (about 100m), or just turn right and follow the trail to Kaitoke roadend. The shelter itself is not the most salubrious place – cold, open, and not treated with a great deal of respect. But on a wet day it offers welcome respite from the rain and a good place to change into dry clothes, and it does mark the end of the long quad-busting technical descent. Smith’s Creek Shelter – Puffer Saddle, 5.0km: An easily runnable track in the bush until the site of a slip is reached. DOC has re-routed the track up and over the slip – a steep climb up and a steep climb back down. Or you could drop down into the river and try that, but there is no defined route. Back on the trail it is easy running again. Watch the markers when you have to cross the stream – the track on the other side is not always where you would look for it. More easy undulating to the start of the climb up the Puffer Saddle. Whether walking or running you will definitely be puffing by the time you get to the top. The track here is steep in places and has some sections of steps. Puffer Saddle – carpark: Very easy downhill running along here on a nice benched track. You will pass the Marchant Ridge turn off on the way. Feel free to head on ‘round for another loop if you are feeling masochistic, otherwise enjoy the cruise back down to the carpark.